The former Everton boss lasted less than year in charge. 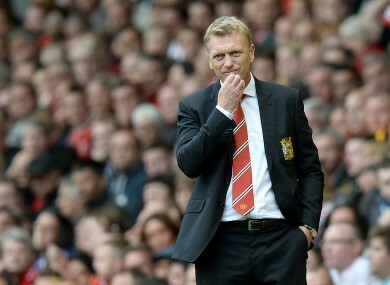 DAVID MOYES HAS been sacked by Manchester United after a disastrous first season in charge of the club. The former Everton boss has overseen the club’s slide from Premier League champions to a likely seventh place finish in a campaign that included 11 defeats, six of which came at Old Trafford. A loss to the 50-year old’s former club on Sunday saw United officially miss out Champions League qualification for the first time in 19 years and that proved to be the final straw for the United board. “Manchester United announces that David Moyes has left the club,” the club tweeted shortly before 8.30am this morning. Despite being hand-picked by Alex Ferguson, Moyes demise comes just 11 months into a six year contract as the club’s owners look to put a new manager in charge before a reported €250 million summer spending spree to rebuild the beleaguered United squad. While a replacement has yet to be announced, Louis van Gaal, Carlos Quieroz, Juregen Klopp and even Ryan Giggs have all been mentioned as possible successors. Email “David Moyes sacked by Manchester United”. Feedback on “David Moyes sacked by Manchester United”.